This is an updated version of a traditional southern meal. Don’t skip the corn-quinoa mix, it’s worth the effort! If you aren’t a fan of catfish, any mild white fish will work. While skillet is heating, place cornmeal in a shallow dish. Sprinkle fish with ¼ teaspoon salt and ¼ teaspoon black pepper. Add 1 tablespoon oil to pan and swirl to coat. Add fish to pan; cook fish 4 minutes on each side or until done. Remove fish from pan; keep warm. Combine ½ cup hot water and quinoa in a small saucepan; bring to a boil. Reheat the pan where the fish was cooked to medium-high heat. Add 1½ tablespoons oil to pan. Add bell pepper, jalapeño, garlic, ¼ teaspoon salt, and ¼ teaspoon black pepper to pan; sauté 3 minutes. Add corn; sauté 2 minutes. Stir in quinoa, tomato, onions, and lime juice. Combine mayonnaise, lime juice, sugar, salt, and green onions in a large bowl. Add cilantro and coleslaw. Toss to combine. 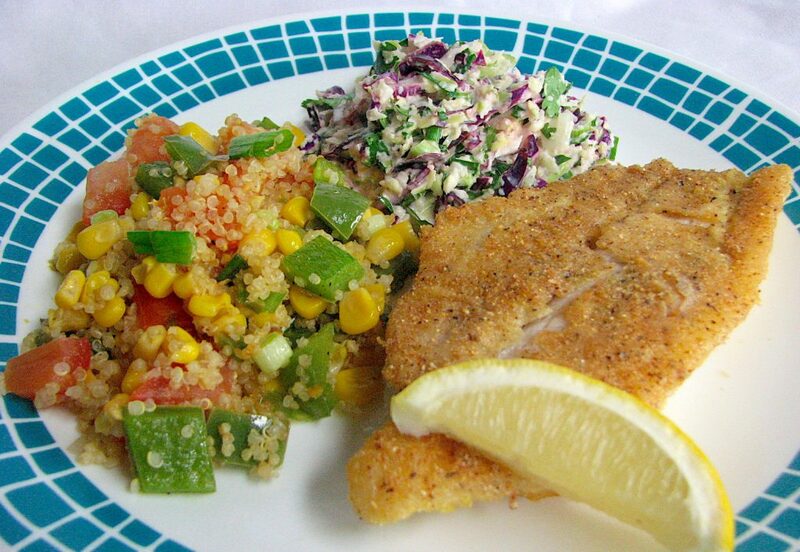 Serve fish with quinoa mixture, Cilantro-Lime Slaw, and lemon wedges.